The Bad Kitty Bakery: Banana Ginger Pops with RECIPE!! It’s Tuesday, and that means there is a new recipe! 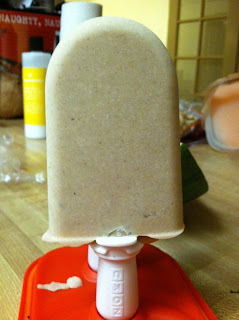 And yes, it is another vegan Zoku recipe, but you can use this with any kind of ice pop mold that you want. You can even use really small paper cups, cover with plastic and poke a popsicle stick through. This recipe was instantly my favorite of all time. It is based on a smoothie that Jason created and I worked with. When you first see this, you may think that it is a lot of ginger, but remember that freezing dulls some of the flavor. This pop has a punch of spice, a sweetness, and a creamy texture. Remember, use a heavily spotted banana. Bananas in this country are picked green in another country, brought here, and gassed to have them ripen. However, the fruit inside does not fully ripen until the outside is spotted with black. What we think of as overripe is just barely ripe in other countries. Blend all ingredients and freeze according to the manufacture’s direction of your ice pop maker.